When I say my child is persistent (yes, maybe stubborn~ she gets it from both Scottish families on either side!) I mean it. She decided this year that our house was visited by the Easter Kangaroo and no one could tell her otherwise, and anyone who tried was promptly corrected themselves. I suppose they might have an Easter Kangaroo in Australia, what with rabbits being rather unwelcome pests there! So, Kangaroo and all, we enjoyed the Easter weekend, having a rare visit from family and many community activities. 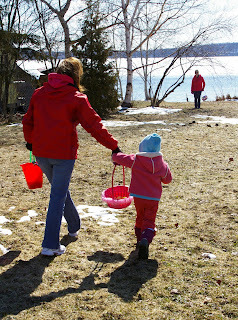 A community egg hunt on Friday and a pancake breakfast to celebrate what looks to be a great syrup season, on Saturday. The EK (Easter Kangaroo!) visited our house on Saturday both indoors for Rowan and outdoors for the whole family. This morning began with an outdoor service at 7 am at the church with frosty ground, misty breath and the colours of sunrise still showing over the hills across the icy lake. Bird song and sunshine and fellowship made it a lovely moment. Our 10 am service was lots of fun with many young children excited and eagerly shouting 'Alleluia'! 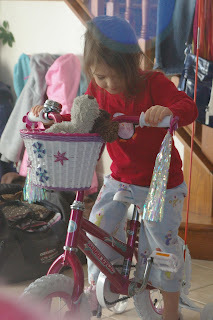 This afternoon, family on their way home, we napped in the sunshine, watched some classic Sesame Street and Rowan perched happily for most of it on her new 'big girl' bike from the EK. We hope the EK and many Easter Blessings came your way, too.